Portions of the Coverdale Bible — the previous major English Translation — was derived from the Latin Vulgate and German versions of the Bible. Although this might have been fine at the time, soon a need was felt to create a more acurate version of the Bible using the original Greek and Hebrew languages. Now that's exactly what William Tyndale had done years before, but he was only able to publish the New Testament and the Pentateuch — the first five books of the Old Testament. Tyndale was martyred before he could complete his translation of the entire Bible. Enter a new character to our story — John Rogers. In his earlier days, Rogers grew up and went to college in England. Later her moved to Belgium and became a chaplain to the Merchant Marines. It was in Antwerp that he met Tyndale and became committed to the Protestant cause. The two became close friends. Rogers was with Tyndale during his last years, and when Tyndale was arrested, he gave Rogers all manuscripts of his English translations, including those that had not yet been published. Although he lived in Belgium, Rogers had many influential friends in England. They encouraged him to take up the task of compiling a scholarly Bible based on the original languages. Surprisingly, Rogers did no translating for his Bible. To create his Bible, Rogers used Tyndale's revision of the New Testament, which had been published in 1535. He also used Tyndale's unpublished Old Testament manuscripts, which were complete through the book of Chronicles. The translation of remaining books of the Old Testament and the Apocrypha came from the Coverdale Bible. The result was a compilation of the work of two men -- William Tyndale and Miles Coverdale. So where does Matthew come in? Actually he doesn't. At this time it was against the law to publish the Scriptures in English. The Bible was printed in Antwerp, and shipped to England. On the Dedication Page, the editor was listed as "Thomas Matthew" — which was actually a 'pen name' for John Rogers. Because of his association with William Tyndale, Rogers was considered a heretic in England, so he chose an alias so that his name would not be associated with his Bible. Thus there was no Matthew. Matthew's Bible was a work by William Tyndale and Miles Coverdale, compiled by John Rogers. Remember, in England during these times, Bible-publishing wasn't like it is today. You didn't just print an English Bible and make it available to everyone. Both the Church of England and, more importantly, King Henry VIII had to approve any translation. So it fell to Thomas Cromwell — Archbishop of Canterbury and friend to John Rogers — to convince the King that Matthew's Bible should be approved for use in the Church and allowed to be distributed in England. Cromwell was one of the folks who had encouraged Rogers to create this Bible in the first place. This was not an easy task. Cromwell knew that John Rogers (still considered a heretic by the Church) was the real editor, but he kept that information from the King. Rogers didn't make Cromwell's job any easier by including more than 30 pages of notes, many of which were critical of both the Catholic Church and the Church of England. However, Cromwell must have talked to King Henry on a good day because in spite of the notes, which Henry never did like, the King gave his license and approval for Matthew's Bible to be "sold and read of every person ... until such time that the bishops shall set forth a better translation, which, I think, will not be til a day after doomsday". This was in 1537. It seems ironic that Henry VIII should permit William Tyndale to be martyred in 1536, and then just one year later give his approval to a Bible of which two-thirds was the work of Tyndale. This, however, was consistent with Henry's impulsive character. John Rogers — knowing the King's fickleness and fearing for his safety — remained in Europe. He moved to Wittenburg, Germany, where became the pastor of a Protestant Church. In 1547 Henry VIII died and the crown was passed to Edward VI. Edward was much more sympathetic to Protestant Reformers like John Rogers. So Rogers returned to his native England in 1548, thinking he would be safe following Henry's death. And he was — for a while. In 1550, he ministered to two churches in London, and later became a Lecturer of Divinity. However things were to change when King James died in 1553 and was replaced by Mary Tudor — Queen Mary I. Shortly after her coronation, Mary re-established ties with the Vatican, and started a severe period of persecution of Protestants and their sympathizers. Once again, John Rogers found himself a criminal. While many of his fellow reformers fled to the safety of Europe, Rogers was obstinate, determined to remain in England and be a fully-committed reformer. He soon found out why the Queen was given the nickname of "Bloody Mary." On July 27, 1553, he preached at St. Paul's Cathedral in London, where he warned the congregation against returning to "pestilent Popery". Shortly thereafter, he was placed under house arrest. His fate was seldom in doubt; Mary was a very powerful queen, and with encouragement from the Pope, she intended to stamp out all forms of religion except Roman Catholic. John Rogers was tried, convicted, and condemned to be burned at the stake. 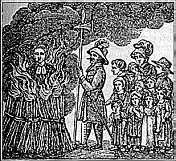 On February 4, 1555, John Rogers was burned to death at the stake in front of his wife and 11 children. He became the first of more than 300 Protestants that were executed during the 5-year reign of Queen Mary. Rogers, with the encouragement of his family, faced his death almost joyously. Like Tyndale 20 years earlier, John Rogers' committment to giving England an English Bible cost him his life. Yet in spite of the Pope, in spite of the Queen, in spite of public executions — England had its Bible, and Matthew's Bible, containing the work of William Tyndale, became a powerful influence — even on later English Bibles. Use the Menu on the left to view actual pages from Matthew's Bible.